Life hands you challenges sometimes. When you are faced with these, it is often difficult to understand why. I have two young boys that were born with a rare genetic eye disorder called ectopia lentis. I don’t know exactly why this happened. All I do know is that it has put us on a path in life that is beyond anything we expected. We have been connected to amazing people we never would have met otherwise. We have had to test our mettle over and over each time victorious in the knowledge that as a family, we can overcome any obstacle. So, I may not know exactly why vision challenges came into our lives. At least now I’ve had time and growth to realize some of the amazing lessons that have gone along with it. If we can do this, we can do anything. Think about any challenge you have lived through or are living with right now. If you can do that, you can do anything, too. 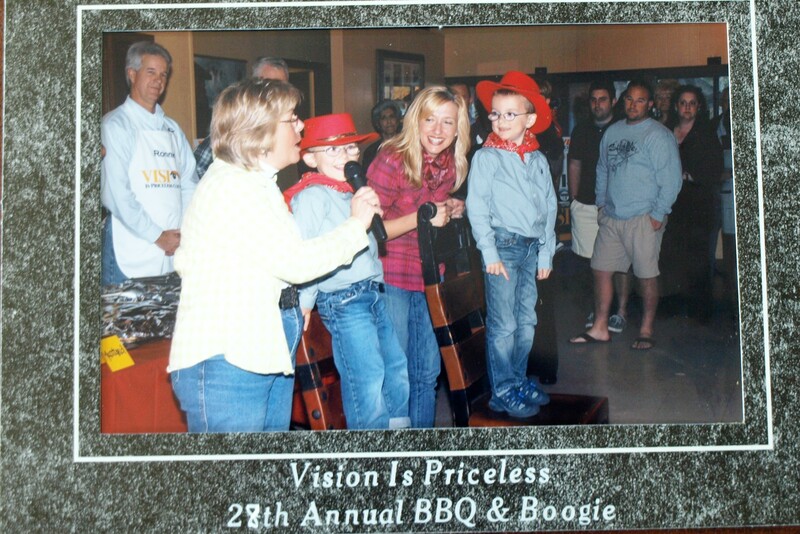 This is a pic of the boys being introduced by the director at the Vision is Priceless annual fundraiser. We are very thankful to this organization for all they do. Check out their link in my blog roll. Can you really consider it to be stress-relief yoga if you have two children utilizing the space you create between yourself and the floor as their tunnel? Hey, at least they were playing together. Full Speed is mastering the many complexities of the English language. He is full of questions and curiosity. He asks me constantly about words and their meanings. Yesterday he asked me what ‘compassion’ meant. I asked where he had heard the word and to describe the context. He said he heard it on his ‘Hotwheels’ cartoon. A compassionate Hotwheels cartoon, who knew such a thing existed? I still don’t fully understand exactly what he was talking about. He said there was an army and then they captured compassion and wouldn’t give it back. I’m guessing he heard it somewhere else. Who knows? I did my best to explain it. I said it has to do with caring about how someone else feels. For instance, if your brother is happy then you are happy for him. Conversely, if he feels sad, then you feel sad. Compassion also means doing what you can to help others feel better. Full Speed seemed satisfied with that explanation. As I sat at the computer yesterday typing away as I am now known to do for the love of my blog, the boys are out playing on the lanai. They alternate between being best friends and mortal enemies. I try to ignore them because I find that the resolution they reach on their own is always more solid than the resolution that Mom reaches for them. It’s not easy to ignore the piercing screams and cries for help (all highly over-dramatized). I think a Mom’s greatest strength is her ability to tune out nonsense so everyone can get on with their lives. I think he is getting it. It is fun to see your growing child begin to understand intricate emotional states. It’s almost as if you can see the adult inside of them beginning to peek out. However, his compassionate feeling didn’t last long. Soon he had snatched his car back and started hitting T.Puzzle over the head with it. Looks like I need to teach T.Puzzle the meaning of self-defense. A Mom’s work is never done.